Showing a little kindness goes a long way, especially to those in need of compassion, nurturing and support. This is particularly true when it comes to young ones, who often struggle with the fundamental task of trying to understand how the world works, an increasingly challenging task in an ever-more complicated reality. For 30 years, an unlikely television personality undertook that very task, giving attention, encouragement, wisdom and support to those who all too frequently went overlooked by their preoccupied, impatient and even unconcerned elders. 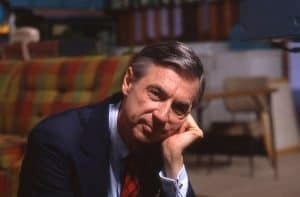 And now the many quiet but profound accomplishments of that soft-spoken, cardigan-clad TV icon are celebrated in the endearing new documentary, “Won’t You Be My Neighbor?” (web site, trailer). 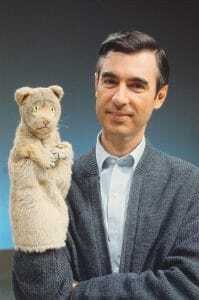 In many respects, Fred Rogers (1928-2003) was probably the last person anyone would see as a television star. By all rights, most programmers probably would have viewed the gentle-mannered everyman who spoke in deliberate, measured tones as their least likely casting choice for hosting a TV program. But, given what Rogers set out to do, there was no one better suited to the job. And, through his long-running PBS series Mister Rogers’ Neighborhood, he made the most of his opportunity. With a mix of lovable puppets, a company of friendly “neighborhood residents” and even some big-name guest stars like cellist Yo-Yo Ma, all of whom engaged with the host in thoughtful conversations and sweet, charming songs, Rogers carefully crafted a program that grew from a local Pittsburgh production into a national sensation. Children’s television icon Fred Rogers, host of the PBS series Mister Rogers’ Neighborhood, on the set of his long-running show, as seen in director Morgan Neville’s endearing new documentary, “Won’t You Be My Neighbor?” Photo by Jim Judkis, courtesy of Focus Features. 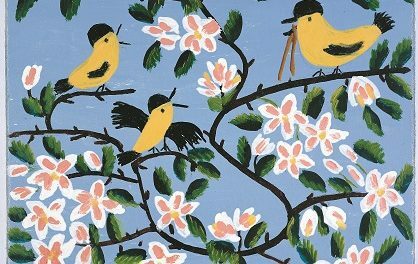 Rogers, who actively sought to spread the word to younger audiences about such concepts as kindness, acceptance and understanding, had just the right mix of qualities that small children could readily and comfortably relate to. As an ordained minister, he had an approachable demeanor that enabled him to effectively convey the importance and relevance of such humane values, but he never preached nor infused his teachings with religious dogma. In many ways, he communicated to his constituency of little ones on their own level, something that made him a big hit with the preschool and kindergarten crowd. Ironically, Rogers disliked much of what was on television, especially for children. He believed that programmers were doing a major disservice to this audience by endlessly broadcasting inane shows filled with silly, slapstick humor that comically but inherently celebrated violence, bullying, humiliation and other undesirable values. He was convinced that the medium could be used more effectively, that it could serve as a positive influence to youngsters in their formative years by presenting programs that taught valuable life lessons and encouraged them to embrace qualities that would eventually make them better adults. Fred Rogers, host of the long-running PBS children’s series Mister Rogers’ Neighborhood, poses with one of his beloved puppets, Daniel Tiger, in the new documentary, “Won’t You Be My Neighbor?” Photo by The Fred Rogers Company, courtesy of Focus Features. In pursuing this goal, however, Rogers didn’t believe in sugarcoating everything. When the show debuted in 1968, the world was experiencing considerable turmoil, such as the Vietnam War and the assassination of Presidential hopeful Robert Kennedy, events that undoubtedly bewildered many of the nation’s youth. 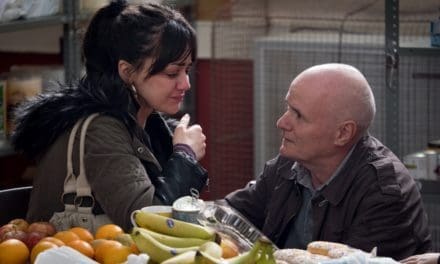 But, rather than shelter children from these unpleasant realities, Rogers tackled them head on, addressing them thoughtfully in ways that kids could understand. He did the same when it came to exploring such issues as divorce, illness, racial strife and death, usually by discussing the subjects in ways that stressed qualities like compassion and tolerance. The hope here was that he could impart realistic but considerate attitudes about these aspects of life, unpleasant though inescapable as they may be. In this sense, as series regular Elizabeth Seamans and producer Margy Whitmer observe in the film, Rogers was quite innovative, if not radical, in his approach. His material may have been dressed up in a pleasant, safe, accessible package, but his show’s content was quietly cutting-edge, far different from much of the other children’s programming of the day, something that discreetly but profoundly set the program apart. 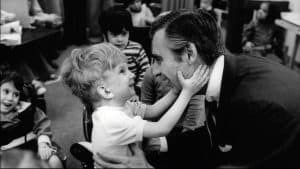 Children’s television icon Fred Rogers (right), longtime host of Mister Rogers’ Neighborhood, meets with a young disabled boy, as seen in the endearing new documentary, “Won’t You Be My Neighbor?” Photo by Jim Judkis, courtesy of Focus Features. Rogers didn’t focus only on children’s issues, though; he had his share of dealings with grown-ups as well. For instance, he hosted two seasons of a documentary series called Old Friends…New Friends in which he interviewed celebrities like Milton Berle and Helen Hayes, taking an approach where he would try to engage in the same kind of thoughtful, meaningful conversation with adults that he did with his younger audiences. He also regularly appeared as himself on TV talk shows like those hosted by Tom Snyder. And, as a passionate advocate for government funding of pubic television, he testified before Congressional committees to make the case for his cause, expressing himself convincingly enough to change the mind of hardened skeptic Senator John O. Pastore, who was all but ready to see the proposed subsidy summarily scrapped. Through his efforts, Rogers truly was a pioneer in children’s television programming. Were it not for his vision, there may not have been the show that he created or the many others that have followed in its wake, such as Sesame Street and The Electric Company. Thanks to someone who believed in the idea that a medium as powerful as TV could indeed do better, we’ve been able to see that notion come into reality. And, given the current state of television, we could certainly use a lot more visionaries like Fred Rogers. 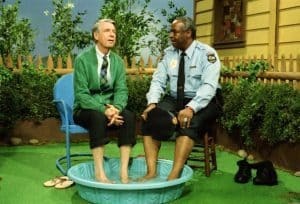 Children’s television icon Fred Rogers (left), longtime host of Mister Rogers’ Neighborhood, shares a moment to cool down on a hot summer day in the neighborhood with series regular Officer Clemmons (François Scarborough Clemmons, right), as seen in director Morgan Neville’s new documentary, “Won’t You Be My Neighbor?” Photo by John Beale, courtesy of Focus Features. Moreover, Rogers served as an excellent example of what it means to see things through on one’s visions. He believed in his convictions that television could do a better job where kids were concerned. He had faith in what he believed was capable of being brought into existence. Were we to apply that same kind of effort to our own aspirations, we all might be able to achieve more of what we seek to accomplish. In that vein, there’s no telling what we might attain. 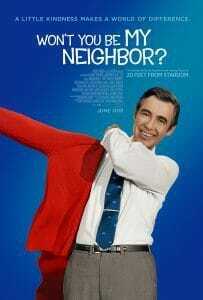 While there’s a slight tendency toward “Won’t You Be My Neighbor?” being somewhat saccharine encrusted, and despite some slightly sluggish pacing in the first 30 minutes, the film comes through successfully on all other fronts, effectively delivering its contents with ample humor, surprising candor and many heartwarming moments. Archive footage featuring interviews with Rogers and segments from his shows reveals the deceptively profound approach he employed and the many sides of the protagonist, including some very different from the nice but nerdy persona for which he’s probably best known. In addition, recent interviews with Rogers’s wife, children, friends and collaborators provide further insights into the man and his motivations. In all, director Morgan Neville has compiled a documentary well worth your time, again confirming this Oscar-winning filmmaker to be one of the best when it comes to this genre. Given the pressures of today’s world, it’s easy to lose our composure and abandon our civility. Under conditions like this, we could all use some kind words and a little comforting to cope with the strife and challenges we face. And that’s where the wit and wisdom of Fred Rogers can do us all a world of good, especially if all of us ultimately hope to create a good world. Documentary filmmakers have a unique opportunity to capture events as they unfold. They show us what it means to be on the forefront of potentially significant milestones in political, social and human development. Their cinematic chronicles provide us with undeniable proof of what transpires, providing a valuable record for posterity. 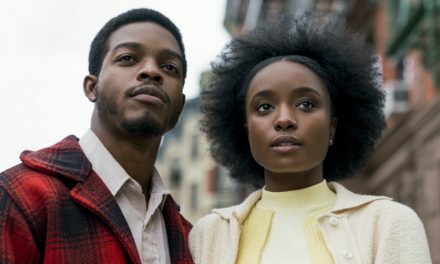 In the case of the civil rights movement, one producer-director was in such a position, and three of her titles have now been preserved in a new anthology documenting the period, “I Am Somebody” (web site), available on DVD and video on demand. Madeline Anderson was a pioneer in many ways. In the 1960s and ’70s, she successfully broke into the behind-the-scenes aspects of filmmaking at a time when women and minorities were all but absent in this segment of the industry. What’s more, she broke ground cinematically with the subject matter she addressed, chronicling some of the most significant civil rights events and trends of the day. Through her efforts, she brought attention to issues that many in mainstream society had never witnessed nor been informed about. Those films have now been given renewed life. As producer of “Integration Report 1” (1960), Anderson provided audiences with a survey approach to significant issues in the civil rights movement, which was just emerging and beginning to gain strength. Through footage shot by documentary legends Albert Maysles and Ricky Leacock, the 21-minute film presents on-the-scene evidence of events as they unfolded in Alabama, Brooklyn and Washington, DC, including an early speech by Dr. Martin Luther King Jr. and protest songs by poet Maya Angelou. “A Tribute to Malcolm X” (1967), a 14-minute segment Anderson worked on for the WNET television series Black Journal with host William Greaves, provides a look at the life and times of the iconic civil rights leader. The film features one of the activist’s more poignant speeches, as well as an interview with his widow, Dr. Betty Shabazz, shortly after his assassination in 1965. 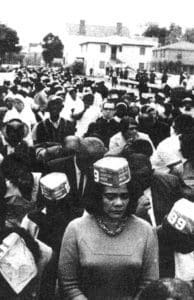 The anthology’s 30-minute title film, “I Am Somebody” (1970), showcases Anderson’s directorial efforts in documenting a 1969 strike by African-American female hospital workers in Charleston, SC. In an effort to obtain union recognition and higher wages, striking workers initially met with harsh opposition from state government officials and the National Guard, but the determined laborers would not be deterred. The film features footage of the protests and the views of opponents, along with rallies headlined by such civil rights activists as Rev. Ralph Abernathy, Andrew Young and Coretta Scott King. African-American hospital workers in Charleston, SC, in 1969 strike for higher wages and union recognition in the recently restored documentary “I Am Somebody” (1970), part of a new anthology of the civil rights films of producer-director Madeline Anderson, now available on DVD and video on demand. Photo courtesy of Icarus Films. In addition to the films, the DVD set includes an interview with Anderson in its selection of bonus features. In this candid and often-humorous conversation, Anderson speaks about her efforts to break into filmmaking at a time when opportunities for women and minorities were few and far between. Her experience provides an inspiring example to would-be filmmakers, especially those who come from comparable backgrounds. This fine collection of restored historical pieces comes back to life at a time when the significance of their message is arguably just as relevant as it was when they were originally made. This calls to mind the time-honored notion about what happens when we don’t learn from the lessons of history. Let’s hope these films help to keep us from repeating the mistakes of the past. For eons, mountains have fascinated us. Their towering peaks have long been a source of mystery, inspiration and awe. But why? That’s one of many questions that the new documentary, “Mountain,” seeks to answer (web site, trailer). 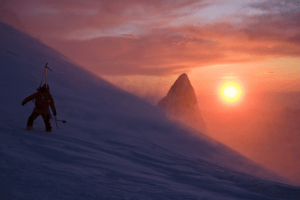 Director Jennifer Peedom’s latest release features a sweeping panorama of the world’s most dramatic and majestic summits, as well as stunning footage of those who would dare challenge them. Backing the breathtaking cinematography is an eloquent score featuring the works of Beethoven and Vivaldi, beautifully performed by the Australian Chamber Orchestra, a combination that provides a genuine feast for the senses. Complementing these elements is a series of observations narrated by Willem Dafoe. Through these voiceover insights, viewers learn what mountains mean as challenges to be surmounted, both literally and metaphorically. The inspiration they engender is something that urges us to reach the heights of our potential, to surpass our perceived limitations and to become more than we thought we can be, regardless of whether we ever put on a pair of climbing boots. 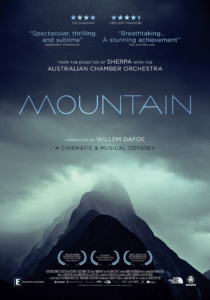 In all, “Mountain” offers us a splendid visual and auditory diversion for 75 minutes, even if the narration doesn’t always match the level of the other elements. Enjoy it, but don’t expect the heavens to part or the ground beneath your feet to rumble. One of many majestic peaks featured in the stunning new documentary, “Mountain.” Photo © Stranger Than Fiction Films, Australian Chamber Orchestra and Definition Films Pty Ltd, courtesy of Madman Entertainment.